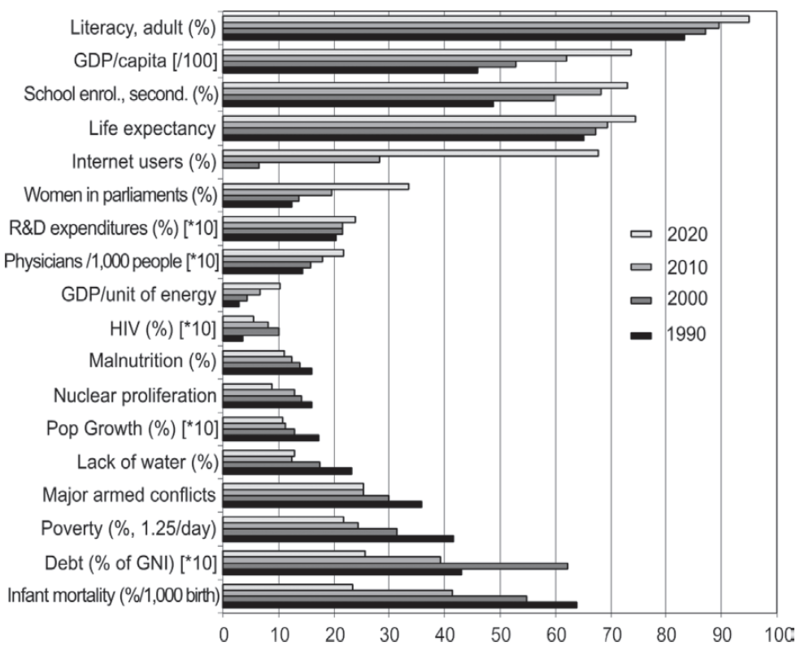 The Millennium Project’s 2011 State of the Future Report, due out August 1, finds that while people are getting richer, healthier, better educated, and living longer, and the world is more peaceful and better connected, half of the world is potentially unstable. “Food prices are rising, water tables are falling, corruption and organized crime is increasing, environmental viability for life support is diminishing, debt and economic insecurity are increasing, climate change continues, and the gap between the rich and poor is widening dangerously,” the report says. “People voting in elections, corruption, people killed or injured in terrorist attacks, and refugees and displaced persons are also identified as key problems. 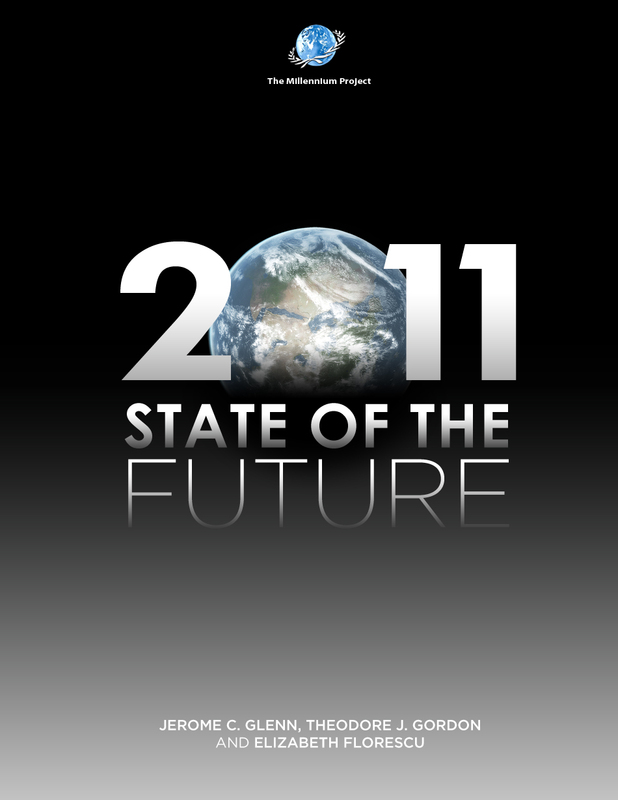 The 2011 State of the Future is an overview of our global situation, problems, solutions, and prospects for the future. “15 Global Challenges” including energy, food, science and technology, ethics, development, water, organized crime, health, decision-making, gender relations, demographics, war and peace, and others are analyzed, studied, and recommendations are made. This report discusses a broad range of future-oriented policy initiatives, such as shifting from fresh water-based agriculture to saltwater-based agriculture; making environmental security the focus of US-China strategic trust, a global strategy to counter organized crime, and collective intelligence as one of the next big topics of interest. It also alerts readers to major changes that seem inevitable. For example, the coming biological revolution may change civilization more profoundly than did the industrial or information revolutions. The world has not come to grips with the implications of writing genetic code to create new lifeforms. Thirteen years ago, the concept of being dependent on Google searches was unknown to the world; today we consider it quite normal. Thirteen years from today, the concept of being dependent on synthetic life forms for medicine, food, water, and energy could also be quite normal. The 2011 State of the Future comes in two parts: a print 106-page distillation of research with tables, graphs, and charts, and an 8,500-page CD. comes in two parts: a print 106-page distillation of research with tables, graphs, and charts, and an 8,500-page CD. Price: $49.95 US dollars plus shipping. The Millennium Project was established in 1996 as the first globalized think tank. It conducts independent futures research via its 40 Nodes around the world that connect global and local perspectives. Full disclosure: KurzweilAI editor Amara D. Angelica is a member of the Silicon Valley Node of The Millennium Project.